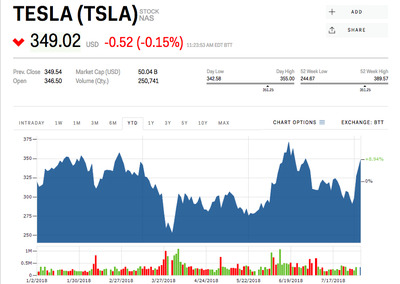 Tesla has climbed more than 13% this week after its second-quarter earnings report showed ir was able to slow its cash burn. The stock on Friday hit $US355, it’s highest level since July 2, costing short-sellers more than $US1 billion. Shares of Tesla continued their post-earnings surge on Friday, rising another 1% to an intra-day high of $US355, their highest level since July 2. On Thursday, the stock climbed more than 12% after the electric-car maker reported a wider-than-expected loss, but showed it manged to slow down its cash burn. A calmer – and apologetic – Elon Musk once-again reassured investors that Tesla would be profitable this year. That oft-repeated phrase appears to have calmed fears of a Tesla bond crisis, with the yield on its bonds expiring in 2025 hitting a low of 6.86% on Friday, their lowest since June 18. Last week, investors were paying a record amount to insure against any potential Tesla bond crisis. Tesla’s second-quarter financials also led to a number of upgrades and price target increases across Wall Street. Analysts’ average price target is now $US318, up from $US310, according to data from Bloomberg. “While we have been cautious on Model 3 ramp, we believe gross margin performance on Model 3 will carry the stock over the next 12+ months,” Oppenheimer analyst Colin Rusch, who upgraded the stock to outperform with a price target of $US385, said in a recent note. 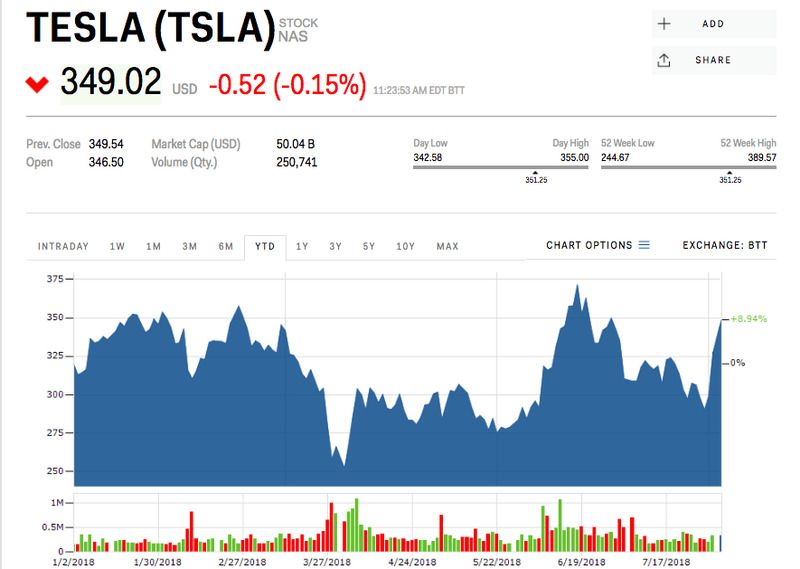 But Thursday’s surge from less than $US300 earlier this week has also cost short-sellers – or those investors betting against Tesla’s stock price – more than $US1 billion, according to data from financial analytics from S3 partners. “We are not seeing a large amount of buy to covers yet, with such a large price move on the open most short sellers that are looking to cover are waiting for a retractment before placing buy-to-cover orders,” S3 managing director Ihor Dusaniwsky said. Shares of Tesla are now up 9% since this year and are quickly closing in on their all-time high of $US389.61 set in September 2017.